The IPO is the most anticipated public offering in a decade, with the company looking to bring in $5 billion in investment. The paperwork reveals financial information that attests to the social network's phenomenal growth. Morgan Stanley, J.P. Morgan, Goldman Sachs, and three other financial firms are underwriting the deal, according to papers filed with the U.S. Securities and Exchange Commission. Facebook had revenues of $3.7 billion in 2011, compared to $2 billion in 2010, according to the filing documents. Net income was $1 billion in 2011, compared to $606 million in 2010. The company had $777 million in revenue in 2009, with net income of $229 million. 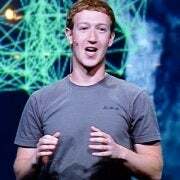 Iconoclastic CEO Mark Zuckerberg founded Facebook from his Harvard dorm room in 2004. The social networking site passed the 100 million user mark in 2008 and now has 845 million users. The site had 483 million daily active users on average in December, compared to 327 million in December 2010, the company told the SEC. Zuckerberg made $1.5 million in 2011, according the SEC filing. Sheryl Sandberg, the company's chief operating officer, had a base salary of $296,000, but with a bonus and stock grants, her total compensation was $30.9 million last year. The publicly available version of the SEC filing does not give a proposed date for the IPO. Facebook has not yet released its expectations for the initial stock price. Zuckerberg, in a letter enclosed in the SEC filing, said he didn't originally create Facebook to be a company, but to be a service that connects people. "Most great people care primarily about building and being a part of great things, but they also want to make money," the letter says. "Through the process of building a team--and also building a developer community, advertising market and investor base--I've developed a deep appreciation for how building a strong company with a strong economic engine and strong growth can be the best way to align many people to solve important problems. "Simply put: we don't build services to make money; we make money to build better services."